Delta Chi finally did it! For the first time in 15 years, Delta Chi successfully made it into Rock Chalk Revue. For those of you who are not familiar with Rock Chalk Revue, it is one of KU's biggest philanthropy events where Fraternities and Sororities compete by putting on musicals. Paired up with the lovely ladies of Tri Delta, the two houses planned, wrote, and performed their original show: The Ringmaster Disaster. The whole process began in the Fall Semester. Directors Zach Maeser, Patrick McAnulty, and Josh Rothschild collaborated with Hannah Schoeb, Maggie Hylton, and Elle McClenny (the Tri Delta directors) to create the show. After presenting their work, the two houses were officially admitted into Rock Chalk Revue. Once admitted, the auditions, castings, practices and rehearsals made for a hectic Spring Semester. Even though the commitment was huge, and the workload was even greater, everyone ended up having a great time and now wants to do it again. The performances took place March 13th, 14th, and 15th. Everything ran smoothly and the audience's reaction was better than expected. They simply could not stop laughing. 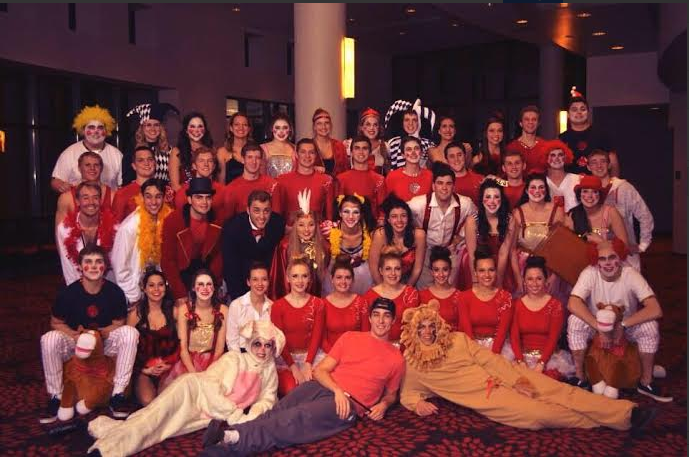 However, when the results came in, Delta Gamma and Pi Kappa Phi's musical won the event. Despite the loss, Delta Chi and Tri Delta still had one of the best shows. It also provided a tangible avenue for some recognizable on-campus presence and involvement. It was a phenomenal experience, and a huge thanks goes out to all who supported the show and to those who got involved.